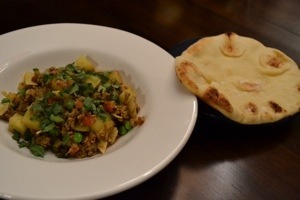 I’ve made beef keema before and liked it. This recipe is a little different. I really thought I had a can of coconut milk but alas halfway through making this recipe I realized that I didn’t. A frantic google search turned up boiling unsweetened coconut in water as a substitute. I think this dish would have been fantastic had I had a can! It was still really good and I’ll definitely be making it again. In a large pot, or deep skillet, heat the butter over medium high heat, until foaming. Add the ground beef, sprinke with salt and pepper, and cook, breaking it apart into small pieces, until there is no pink left. Add the onion, garlic, ginger, and curry powder. Stir and cook until the onion has softened, about 5-7 minutes. Stir in the potato, making sure to coat it with all the flavors in the pot. Add the broth, coconut milk, and canned tomatoes with their juices. Bring to a boil, turn down to a simmer, and cook until the potato is tender and the sauce has thickened, about 15-20 minutes. Use a wooden spoon to crush most of the potatoes into the broth. Stir in the peas and continue to cook until the peas are just cooked through, around 5 more minutes. Season with more salt and pepper to taste. Serve sprinkled with chopped cilantro, accompanied by rice and/or naan or chapati. I had picked up a small bag of potatoes at tjs and was planning on either roasting them or mashing them. Then i remembered I had pinned some yummy looking potato recipes, so I decided to give one of them a try. They came out super yummy! A nice change from mashed potatoes! 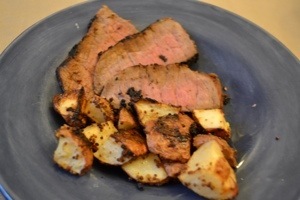 I served them with London broil and corn on the cob. The corn didn’t make it to the picture unfortunately! 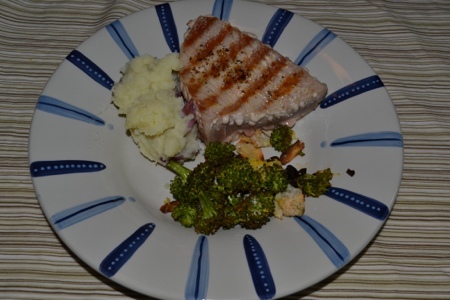 I added the marinade recipe below it was delicious! Spread out on baking sheet and bake until crusty and golden brown – they can take anywhere from 30 minutes to an hour depending on how well done you like them and how big you cut your potatoes, check every 10 minutes starting around the 30 minute mark. Cut the potatoes into small 1″ x 1/2 inch pieces. These take the longest to cook so cutting them small ensures everything cooks evenly. Preheat oven to 375°. Spray one large non-stick baking sheet, or two small ones with olive oil spray to prevent the potatoes from sticking. In a large bowl, combine potatoes, onions, peppers, olive oil, salt, pepper, rosemary and garlic powder. Mix well to be sure everything is coated with oil and seasoned evenly. 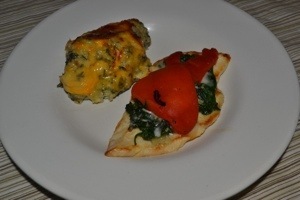 Pour onto the prepared baking sheet and place in the center of the oven; bake for 15 minutes. Use a spoon to toss so nothing sticks or burns. Add the sausage to the baking sheet with the potatoes and vegetables and bake, tossing once or twice for 25-35 minutes, or until your potatoes are cooked through. Cooking time will vary depending on the thickness of your potatoes and sausage, keep an eye so they don’t burn. This was our last meal before we lost power during the hurricane. The chicken was pretty good. I think I would have liked it better with a different cheese something with more flavor. The potatoes were a little too spinachy for me! Preheat oven to 400°. Season chicken with salt and pepper. Lightly spray a grill with oil or grill outside on a gas grill. Cook chicken on the grill until no longer pink, careful not to overcook or you’ll have dry chicken. In a large crockpot place potatoes and cover them with ½ cup of broth, spinach (undrained), butter, onion, and salt. Cook on low for 6 – 7 hours or high for 3 hours. Mash potatoes in a large bowl or right in the crockpot. Transfer to a large casserole dish. Top with Cheddar cheese. I threw some BBQ chicken in the crockpot earlier this week. 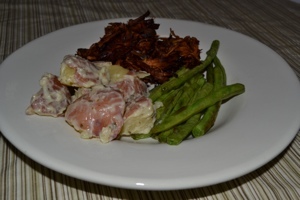 And i had potatoes and green beans from the csa some decided a potato salad sounded good. This one was a bit different than the traditional potato salad. It was ok, but we decided we like the traditional better! I sautéed the green beans with a little garlic. Boil potatoes in lightly salted water until fork tender. Drain, cut in equal size pieces, then place in a bowl. Toast pine nuts in a skillet over low heat until just lightly golden. Remove from heat. Pour half the dressing over the potatoes and toss to combine. Add more dressing to taste. Cover and refrigerate the potato salad for a few hours. To serve, sprinkle lots of small basil leaves over the top. When it’s done, take it out of the oven, zest a lemon over the broccoli, squeeze the lemon juice over the broccoli, add freshly grated Parmesan cheese. Melt the butter in a large, well-seasoned cast iron skillet over medium heat. Add the potatoes and onions and cook, stirring occasionally until tender and brown, about 15 minutes. Stir in the garlic, salt, and pepper, and remove from the heat. 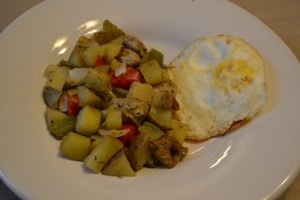 Push the potatoes aside to make 2 evenly spaced shallow nests and break 2 eggs into each. Bake until the egg whites are cooked and the yolks are still runny, about 10 minutes. Sprinkle the cheese over the eggs and continue baking until it just melts, about 1 minute more. Serve immediately. 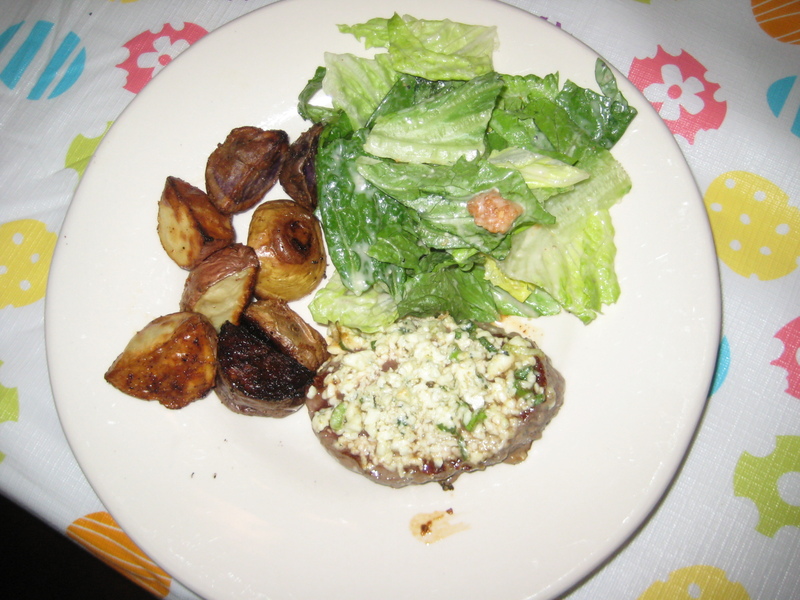 i watched rachael ray make these steaks on her 30 minute meal show last week and thought to myself – YUM-O! i modified the recipe slightly based on what i had in the house. i served them with some roasted tri-color potatoes from tj’s and dole light caesar salad. the end result is DELICIOUS!! Season the steaks with salt and pepper. Rub with a clove of cut garlic. Coat the steaks lightly in extra-virgin olive oil. Chop the scallions, whites and greens. Thinly slice the sage and finely chop the parsley. Combine the scallions and herbs with the Gorgonzola crumbles. heat a skillet over high heat. Add the steaks and caramelize the meat on both sides, a minute and a half per side should do it. Turn the oven off. Top the meat with the gorgonzola and transfer the skillet to the oven. Let the meat sit in the hot oven 4 to 5 minutes. The Gorgonzola will melt down over the meat and the steaks will be tender and pale pink inside.